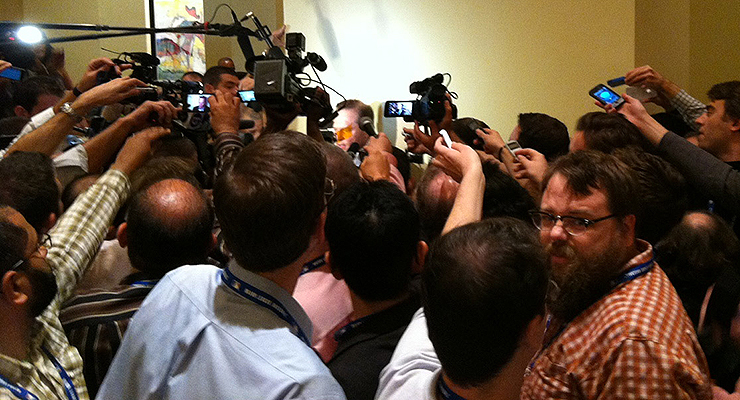 C. Trent Rosecrans amid the throng surrounding Scott Boras at the Winter Meetings (via Eno Sarris). So you say you want to be a beat reporter. Do you know what the life is really like? Are you ready to travel? You’ll have to travel like you never have. Terrible mornings will be your everyday. “I’m awful at waking up in the mornings, in large part because I’m also awful at falling asleep at a decent hour.” says Arizona Central Sports‘ Nick Piecoro. But Piecoro will often make an effort to get his seven-to-eight at the expense of other productivity, so you could too. Maybe, right now, you scoff. Sleep when you’re dead, you yell at the screen. That’s fine! For some. Don’t forget that travel also means time away from people you care about. The young guys talk about broken social lives. Pavlovic says that “writing until midnight most nights hurts the social life,” but that he’s lucky that most of the people in his life are Giants fans and understand. They’d love to have his job, so they don’t mind that he can’t ever hang out before midnight. The schedule just won’t allow you to stay as healthy as you’d like, and the fact that the easiest — and perhaps only — way to get to know the cities you visit on the road is through their restaurants, that fact doesn’t help at all. Ah, you laugh, I’m married! I have kids! My prodigal gut is fine with me! I’d love to leave the house and sleep in more than I can at home. Rosecrans hears you then: “I have a nearly two-year-old, so (don’t tell my wife) the road is where I get to sleep in,” he admits. But that comes at a cost. Think of Rosecrans’ two-year old daughter. Things from “changing a diaper to getting her dressed to fixing her breakfast to finally buckling her into the car seat,” things that you didn’t think you’d miss, those things you’ll miss after a while. He does. Ah, yes, I know all that you say, but I love baseball. And talking to baseball players regularly would be awesome. So what. Imagine if you had this sort of interaction with your co-workers every day. Maybe that’s why lawyers make the transition to baseball writer so seamlessly. Every writer who’s worked the beat will have a story like this. Ken Davidoff, a former beat writer and now the national columnist for the New York Post, once had a dust-up with Paul O’Neill — the reporter admits he could have given the player a better chance to respond in full to a piece he was writing — and the player was upset. O’Neill said their relationship was “done” and encouraged other players not to talk to Davidoff. “He relented after about a month, and we’ve gotten along fine since,” Davidoff says. You’ll have to grow a thick skin if you’re really going to go after this job. Get ready to play the on-the-record-off-the-record game. One player felt I’d quoted him when we were off the record despite never having said anything about it and obviously speaking into my recorder. Those were some sweaty palms jammed into my jeans the next time that team came to town. Thankfully, he wasn’t very mad. Piecoro remembers that he once quoted a player extensively about something in a column… and the player thought the entire conversation was off the record. Both us felt that “sickening feeling of finding out you inadvertently broke someone’s trust,” as Piecoro puts it, but it’s not practical to remind every player, every time, that what he is saying is quotable. Especially when you’re holding a recording device up to their face. Once you’ve talked to the players — and many agree with Davidoff that “the most important skill to own is the social skill,” so you better love talking — the difficult part of the job is not over. You have to actually write those things down in a timely manner, which means hard deadlines. Transcribing will be your bane. “Transcribing is like shoveling your car out so you can go to work,” says FanGraphs’ king of the Q&A, David Laurila. “It’s absolutely the worst part.” Not only is the job mindless, but errors can turn “psychic” into “psycho” as it did with a piece of mine this year (thankfully, Jonathan Lucroy is a nice person). Even if you get someone else to do the transcribing for you, you have to check the work — an intern once omitted entire sentences out of Laurila’s interview. Type, rewind, check, type, rewind, check, type, rewind, check. Are you having fun yet? Then make sure you do it all in time for the right edition of your paper. Rosecrans remembers (not fondly) a mid-afternoon game that carried with it an earlier deadline than he expected. He discovered he had a half-hour to write his two pieces that he’d been planning in his head as he left the clubhouse. Get used to muttering obscenities after moments like these with your desk editor. Maybe Piecoro sums it up best: “I love sitting in press box in San Francisco during day games. I love walking across the Clemente Bridge in Pittsburgh. I love putting on a jacket during night games in San Diego. I love looking out over the city from up high in the Wrigley Field press box. So you want to be a beat writer. Are you sure? I throughly enjoy your articles and chats. Your comments are engaging and spot on. You are the first person I search on the internet each morning. Over the years I have filtered out most of the so called baseball gurus. You are one of the seven people I follow. I find you to be the best of the best! Keep up the great work, I appreciate and enjoy your efforts. You and coffee make my mornings! Thanks very much for that comment! She was 100% correct and, unbeknownst to you, probably saved your future. Money is not everything, but waking up and doing something that you love is by far, the most important thing. Awesome write-up! Really well done! Well, for one thing, the salaries of the two professions were a little more closely aligned. A really good look at one of the most unique jobs in journalism or any walk of life. But you know as well as I that to be a great beat writer, you have to do what Kerouac did: take Benzedrine! I did it for 10 years and as a woman (and a newlywed, at the time), it’s especially a crusher on the personal life, all-consuming in a way no other sports job is if you aspire to do it right. And that was pre-Twitter. At the same time, having covered most other sports, I miss the tremendous amount of access and one-on-one time you can get with the players if you need it. I don’t miss off-days in Milwaukee and Pittsburgh. Bucdaddy raises a very good point about the relationship between journalists and players. Prior to the mid 60’s, writers and players had a lot in common money wise. This fact was also true of other journalists vis a vis the general public. Nowadays, there is a massive financial disparity between an average beat writer and all players. Ditto political journalists and the average Joe. How many journalists these days hang out in blue collar bars the way Mike Royko and Jimmy Breslin did. Not many. They are too busy being coiffed for their next TV appearance. Social media has also made baseball writers easy targets and an outlet for frustration. I have a lot of respect for someone able to accept the heat and still produce. I can’t imagine trying to generate daily content. I was at odds many times with Geoff’s opinions, but was always amazed at his ability to keep things interesting and his willingness to post what he thought was relevant whatever the backlash might be. All beat writers are undervalued. Hi Bucdaddy. Chuck Feeney was a very dear friend of my parents and mine.. His brother Art called me this evening to tell me he passed away this morning… I was so said because I had been in touch with him through the years up until 7 months ago when he went downhill. Enjoyed the story and have so many of my own.